Don't eat that! Or touch it! 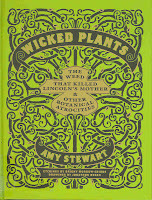 This book has some slight British connections, but Wicked Plants: The Weed that Killed Lincoln's Mother & Other Botanical Atrocities by Amy Stewart focuses mainly on dangerous or disgusting North American plants. And who knew there could be so many of them?? Two pages in, I was startled with the information that every year in the U.S., electrical outlets cause 3,900 injuries, but nearly 70,000 people are poisoned by plants. Each plant family in the book is then given a designation at the top of the page: deadly, intoxicating, dangerous, illegal, painful, destructive or offensive. There then follows a historical description of how the various unpleasant properties of each plant were discovered. For instance, how in the 19th century Duncan Gow, a Scottish tailor, unwittingly ate a sandwich made with "greens" which turned out to be hemlock. Or how kudzu was actually introduced by the U.S. government, who encouraged farmers to use it to feed livestock and control soil erosion. This book is full of alarming and creepy facts. It makes me wonder how any of our ancestors survived the dangerous outdoors! The plant that killed Lincoln's mother, by the way, was the milkweed, which livestock ate and then passed on the plant's poisonous properties to humans by tainted milk or meat products. I was also surprised to learn that many seemingly benign plants can also cause, if not outright death, then at least unexpected problems. For instance, I was alarmed to read that people who have an allergic reaction when exposed to poison ivy (I am apparently one of the lucky 15% of people who suffer from this) might also be sensitive to the rind of mangoes. Thanks for that info! Or that handling celery, coming in contact with lime peels, or even eating too much corn (well, subsisting on a diet of only corn, really) can cause horrible reactions or death. Seems Dr. Atkins was onto something after all! Yes, the book is very entertaining, so I'm sure any of her writing would be great! I'll keep an eye out for it!